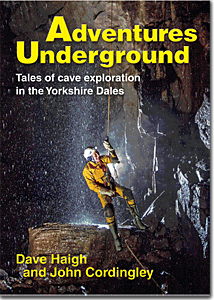 The Dales caving book “Adventures Underground” written by Dave Haigh and John Cordingley (published by Wild Places) has proved very popular, softback copies are still available, but the limited edition hardback sold out really quickly. When writing the book the authors realised that they would need help from a lot of cavers to complete it. Because of this they undertook to receive no royalties, instead deciding to donate them to their favourite charities; Cave Rescue and Macmillan Cancer Support. 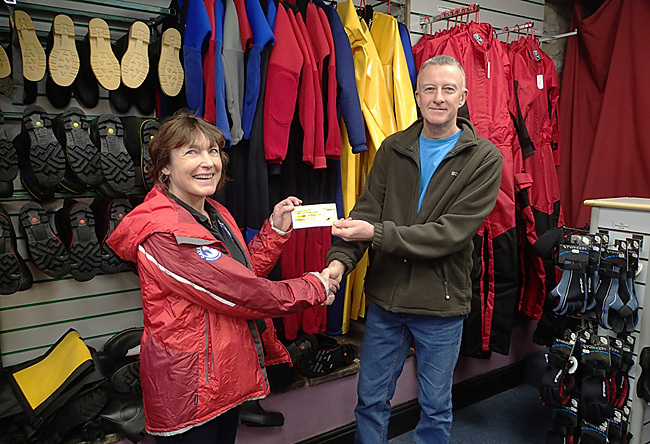 On the 16th September 2017, at Inglesport (Ingleton), John Cordingley presented BCRC Treasurer Heather Simpson with a cheque for £675 as the BCRC’s share of the first royalties (Macmillian Cancer Support received an identical amount). A big thank you to the authors for their generosity and to all the cavers who helped with the project by providing information, surveys, photographs etc, and to everyone who has bought a copy. Plus, thanks to David Rowe and Inglesport for helping with the cheque handover. Not got a copy yet? If you haven’t got your copy of “Adventures Underground” yet you can buy it online at: Wild Places Publishing or at all good caving shops.